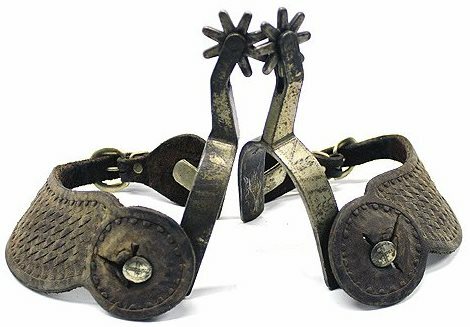 Boone Spurs were made by the Boone family. They descended from Daniel Boone himself and they helped write history in the West just as surely as their predecessor did. Jerry Clayton Boone moved into Texas around 1865 from North Carolina, Clayton was the great-great-grandson of Daniel Boone, and found work in Texas in his half-uncle’s blacksmith shop. Clayton Boone had four sons and he taught all of them the blacksmith trade. His sons were: Bob Boone, Pate Boone, Dee Boone and Clyde Boone. In addition to Clayton and his sons there were other Boone family members who are known to have been in the blacksmith trade and producers of bits and spurs. Of all the sons, Bob showed the most interest and talent at the trade of making bits and spurs and many great examples can be found in the collections of advanced collectors. While Bob’s work shows influences of the Texas tradition, he also employed techniques such as pierced designs, inlays, and chased iron that were more often seen in fancier California or Mexican styles. The family moved around often and over time different family members were in locations all over Texas, Oklahoma, New Mexico, and even into California. Bob and Pate Boone ran a Wild West show for a time where many of the other family members helped out as well. Everywhere the family went they opened blacksmith shops and produced bits and spurs as well as doing general blacksmith work. The range of Boone pieces out there is incredible and you can see odd bits and spurs off all shapes, sizes, proportions and levels of detail. Finding a Boone marked bit or spur is quite rare as many of the pieces that were made by the family were not marked. In addition, just because a piece is marked does not automatically make it authentic, there are many different known markings used by the Boone family but they aren’t consistent and new markings are sometimes found. It’s highly recommended you consult with a knowledgeable dealer to help authenticate and figure out which Boone made any given spur or bit. The most well known and collected bits and spurs will be attributed to Bob Boone, but bits and spurs attributed to other family members can also be quite valuable. For help valuing or authenticating your Boone bit or spurs, please Contact Us. Click here for information on Boone Family Maker’s Marks.